In my thirtieth year, in the fourth month on the fifth day, while I was among the exiles by the Kebar River, the heavens were opened and I saw visions of God. Ezekiel, like Daniel, was one of the exiles taken into captivity by Nebuchadnezzar. The events of Ezekiel’s life, his visions and prophetic messages were roughly concurrent with those of Daniel. They were operating in the same time and space. While Daniel and his homeys were busy working in the royal administration, though Ezekiel appears to have been operating in different circles. Nebuchadnezzar took the best and brightest back to Babylon and Ezekiel, like Daniel and his trio, was clearly a man of great intellect. A priest, Ezekiel was a spiritual leader and certainly ministered to his fellow exiles in Babylon. As I read the chapter this morning, I found myself thinking about this period of exile as it fits into the time line of the Great Story. As mentioned in yesterday’s post, this is a climactic period of time in the story line. For five hundred years the kingdom of Israel and split-off kingdom of Judah have existed, but now those kingdoms are coming to an end and there is the definite sense that we’re closing the chapter on this section of the story. But, it’s definitely not the end – and that’s a big part of the theme in the visions of both Daniel and Ezekiel. I’m fascinated by the fact that God was extremely active among this group of exiles in Babylon. Through the visions and experiences of Daniel we realize that God is at work even in the rise and fall of these other nations. 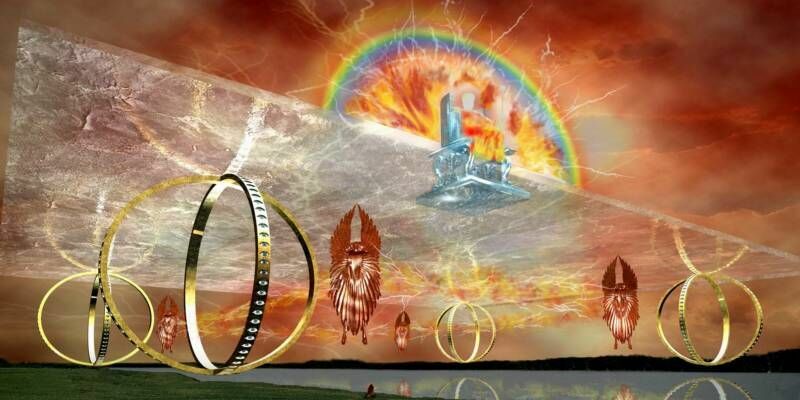 Through Ezekiel we will experience an even larger amount and greater depth of prophetic word and word pictures. The bottom line is that God has a plan, and He is working the plan. After this part of the story, there will be a long period (roughly 400 years) of relative silence before the angel Gabriel breaks the silence with personal visits to two unlikely women. Today, I’m thinking about my own personal story as a microcosm of the Great Story. My experience is that God has been particularly active during certain stretches of life’s journey and relatively silent in others. My journey has contained distinct periods of time and purpose that seem to stand in contrast to one another, yet I sense are the working out of a larger part of a larger story that is beyond me. Stories within stories. Wheels inside wheels. Layers upon layers. Some mornings I simply marvel at it all. This is one of those chapters where I can’t picture and completely understand, but will some day! In this vision, I see a picture of the glory of God’s throne in heaven and a picture of earth with everything set in motion. My mind then jumps to a journey of these things coming together, slowly integrating. I don’t completely understand how that can happen, but in my own life I see the push and pull of God drawing me away from the commotion to the quiet of Him.